The Safe-T-Sport Hinged Stabilizing Knee Brace, Jobst, is a highly reinforced brace to keep the knee secured and tracking properly. This wearable device is similar to the Safe-T-Sport Stabilizing Knee Support, yet includes hinged reinforcements to prevent side-to-side flex as well as protecting the knee from hyperextention. The hinged Safe-T-Sport knee brace surrounds the knee is a soft neoprene sleeve. The metal inserts are safely covered by the material so the wearer can safely slip this through the leg and over the knee. 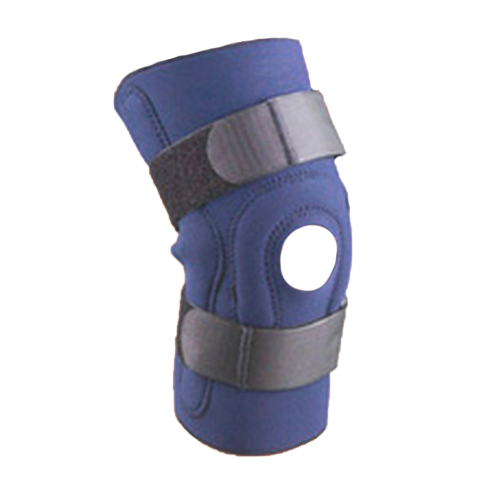 The brace also includes a superior horseshoe for added patella (knee cap) stability. Two loop lock straps secure the brace to the knee from both above and below the knee. The straps can be used to tighten and adjust accordingly. Its sports neoprene with nylon terry liner has a soft, seamless feel against the skin. It features an open patella design and easy slip on style. The braces come in numerous sizes to accommodate most. They are available in either black or navy colors. The brace secures the knee and can position it properly for proper tracking. The brace will keep the knee from hyperextending as it has a built-in stop. The sleeve includes side hinges to prevent medial/lateral movement. The brace has a superior horseshoe for added patella stability. The two loop lock straps allow for easy means of tightening the brace.